Investing is weird, right? Well, it is until you try it with SoFi. That’s why, earlier today, we launched two new ETFs (aka exchange traded funds) called the SoFi Select 500 ETF (NYSE: SFY) and SoFi Next 500 ETF (NYSE: SFYX). Maybe you’re an investing pro and know all about ETFs. If you are, then skip this next sentence: ETFs are funds that track a stock index or basket of assets – they trade like stocks on an exchange, with prices changing as they are bought and sold. With an expense ratio of zero for both SFY and SFYX for at least a year1 (yes – ZERO fee), these funds are designed with your needs and preferences in mind. We don’t think you should pay money to make money. And we know getting started is the greatest barrier to entry when it comes to investing, so we wanted to make this as accessible as possible. SoFi Select 500 ETF (SFY) is composed of the 500 largest publicly traded U.S. companies, while each stock’s contribution to the ETF is based on the company’s growth rates. SFY tracks the performance of the Solactive SoFi US 500 Growth Index, weighing each company based on three key growth signals – top-line revenue growth, net income growth, and forward-looking consensus estimates of net income growth. Traditional indexed ETFs often weigh only market capitalization. 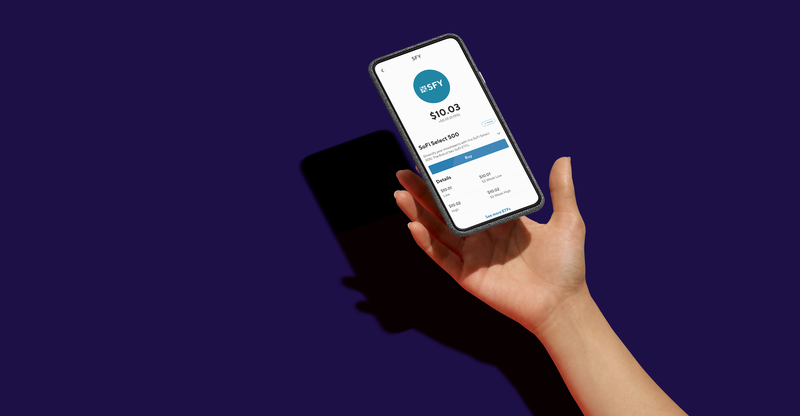 SoFi Next 500 ETF (SFYX) is composed of 500 mid-cap U.S. companies, and similarly, each stock’s contribution to the ETF is based on the company’s growth rates. SFYX tracks the performance of the Solactive SoFi US Next 500 Growth Index, using the same criteria that underpins SFY, focusing on the 501st through the 1000th largest domestic companies. SFY is designed to give investors a smarter US large-cap core equity holding, while SFYX is meant to provide investors with a thoughtful approach to accessing US mid-cap companies with compelling growth exposures. Both funds can serve as key building blocks in a well-constructed equity portfolio. But we’re not done yet: expect more exciting news from us in the ETF space soon! You can read more about these funds , including fact sheets and prospectus, here. And give SoFi Invest a try here. Before investing you should carefully consider the Fund’s investment objectives, risks, charges and expenses. This and other information is in the prospectus. A prospectus may be obtained by visiting www.sofi.com/invest/etfs/. Please read the prospectus carefully before you invest. There is no guarantee that the Fund’s investment strategy will be successful. Investments in REITs involve unique risks. Securities in the real estate sector are subject to the risk that the value of their underlying real estate may go down. Shares may trade at a premium or discount to their NAV in the secondary market, and a fund’s holdings and returns may deviate from those of its index. These variations may be greater when markets are volatile or subject to unusual conditions. A high portfolio turnover rate increases transaction costs, which may increase the Fund’s expenses. The Funds are new and have a limited operating history. The funds are passively managed and attempt to mirror the composition and performance of The Solactive SoFi US 500 Growth Index2 and The Solactive SoFi US Next 500 Growth Index3. The Fund’s returns may not match due to expenses incurred by the Funds or lack of precise correlation with the index. It is not possible to invest directly in an index. You can lose money on your investment in the Fund. Diversification does not ensure profit or protect against loss in declining markets. 1Investors buy and sell ETF shares through a brokerage account or an investment adviser like ordinary stocks, brokerage commissions and/or transaction costs or service fees may apply. Please consult your broker or financial advisor for their fee schedule. The Fund’s investment adviser has agreed to waive its Management Fees for the Funds until at least June 30, 2020. U.S.-listed companies weighted based on a proprietary mix of their market capitalization and fundamental factors. It is not possible to invest directly in an index. 3The fund is passively managed and attempts to mirror the composition and performance of The Solactive SoFi US Next 500 Growth Index. This index tracks the performance of the 500 smallest of the 1,000 largest U.S.-listed companies weighted based on a proprietary mix of their market capitalization and fundamental factors. It is not possible to invest directly in an index.